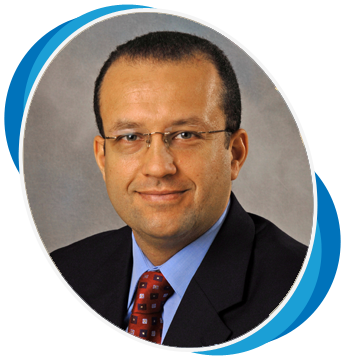 Tamer Mahmoud, M.D., Ph.D., is a Professor of Ophthalmology at Oakland University William Beaumont School of Medicine. He moved from North Carolina in 2017 where he was a tenured Associate Professor of Ophthalmology and the Program Director of the vitreoretinal surgery fellowship at the Duke Eye Center. He received many awards over the years, including the “Senior Honor Award” from the American Society of Retina Specialists, the prestigious Robert A. Machemer award from the Duke Eye Center, the “Distinguished Teacher of the Year Award” from the Kresge Eye Institute and the “Golden Globe Award” for residents’ education from the Duke Eye Center.